I love cone trees. There are so many different kinds out there on the internet. I'm always looking around to see what inspires me to craft. I've been looking at some on the Neiman Marcus web site, admiring their design and pattern. 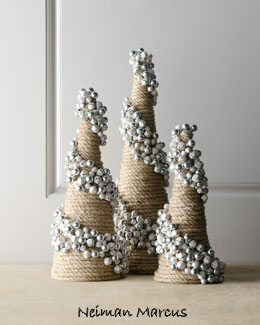 These cone trees are bands of jingle bells intermingled with small silvery ornaments. How beautiful is this? However, after checking on the cost of buying a lot of jingle bells and small ornaments, I can see why they sell the 24 inch tree for $120.00! I've been thinking about trying to make a tree like this for quite a while. I just couldn't justify spending that kind of money buying jingle bells for a craft project. Even the dollar store wouldn't solve this dilemma. A light bulb went off when I thought about the assorted purple decorative filler marbles I had accumulated in hopes of doing something with them. Instead of jingle bells, I would use filler marbles. I began wrapping a 24 inch styrofoam cone with sisal rope. I hot glued the top and every few rows or so. Next, I wrapped a plain purple ribbon around the sisal wrapped cone tree. I did this as a guide to add the different sizes of flat marbles and also for the decorative fillers to look like "bands of marbles." I started hot gluing the marbles to the ribbon . . . staggering them as I glued. The detail of the marbles is quite striking! Adding texture along the way! I love the way this turned out! Very festive and quirky! And, it can remain as a decorative accent all year long! Take a little time to enjoy this holiday season! Will see you in the new year! fabulous Gail~! your creative skills amaze and inspire me. Merry Christmas and thanks for helping make this year brighter for me will all your great products and tutorials. Now I just LOVE this project! thanks for sharing! This is so beautiful! I love purple! Following you now! Wow! Your tree is just FABULOUS! You are so very creative to come up with an alternative to achieve such a beautiful decorative piece that you can use all year long. Thanks for sharing how you did it with us. You've done it again Gail! This tree is so pretty and fun. I love how you created your own design by using what you already had as an alternative to the jingle bells. Hope you have a fabulous holiday season! This is so beautiful that I just have to pin it for next year! It's absolutely lovely. Gail, you know I love a good hack, but you actually took a $120 idea and kicked their tail feathers! Your tree is a lot better, with more sparkle and shine, PLUS....IT'S PURPLE! Gail, did you pick up some thoughts from me through esp? I wanted something in sisal rope for my living room and found a sisal rope rug at Ross. Can't let any cats near it, though. These are beautiful and I love the colors. Glad you shared them on I Gotta Try That. What a wonderful tree! You've given me some great ideas! Thanks! And thanks for linking up at Throwback Thursday. I just love cone trees. So many possibilities. I love the purple!